There are names that echo down the corridors of American literature. Even the relatively ignorant like me could cite these names. John Steinbeck is one of them. 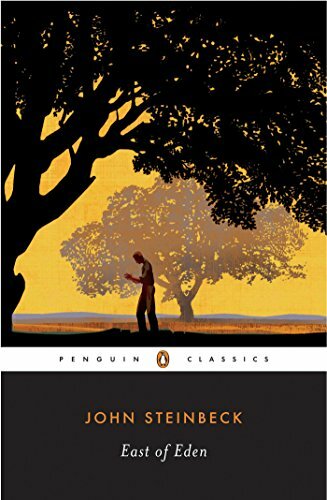 Though I had only heard of Grapes of Wrath, I was intrigued by the vast array of Steinbeck's writing and eventually settled on East of Eden. East of Eden attracted me because of its interested with the Cain and Abel story of Genesis 4. Published in 1952, Steinbeck considered this novel the novel of his career. How can one turn that down? East of Eden follows the family lineage of the Trask and Hamilton families. They—through ineptitude, love, jealousy, and naivety—reflect the world and destructive choices of Cain and Abel. Steinbeck's writing is brilliant, beautiful prose. His characters have depth. The dialogue (something which I retain disdain for) between Adam Trask, Samuel Hamilton, and Lee was routinely excellent. In terms of writing, East of Eden is brilliant. Which makes it all the more frustrating that East of Eden left a taste of disappointment in my mouth. It took a couple hours of reflection to figure out what had placed the disappointment in my mouth. At first, I thought "are Steinbeck's characters shallow?" But that was not it. No, it was the timshel—"thou mayest"—moment near the center of the book that redirects the characters towards their resolutions. My disappointment was not in the writing but in the lesson derived from Genesis 4.
timshel. I'm no Hebrew scholar and so it frustrates me to be frustrated with some of Steinbeck's characters and their fixation on this word. "Thou mayest" becomes the principal, the silver lining behind a book of bitter love and disappointment. I would almost prefer that the book had ended with no hope. Steinbeck's intellectual characters routinely refer to Cain as the father of the human race. This understanding of Genesis leads them to see the "thou mayest" conquer sin to be an offer and challenge to the race of humanity. But that's not where hope comes from in Genesis, it comes from the line of Seth. And that's ultimately where my frustration with Steinbeck rests—the location of his character's hope. For all the beautiful writing, believable characters, and engaging dialogue ... I could not endure Steinbeck's hope in timshel. 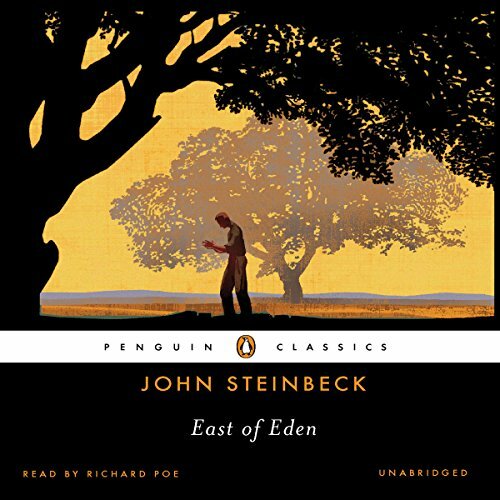 Read by Richard Poe, East of Eden was a delightful listen. Poe's voice is perfect for the prose. His male range of voice is decent. But his female range of characters is pretty bad. Eventually, everything blends into "Kate" and leaves one with the eerie feeling that her persona infects all the female characters—which is neither true nor Steinbeck's intent. As with most audiobooks, there are good and bad. And I would place Poe's rendering of the lengthy prose of Steinbeck in the very good category. In conclusion, East of Eden was a disappointment. Not because it wasn't good. It was great. But I came to it with unreachable expectations. And ultimately, my own pessimism frowned at the optimism that litters the eventual climax of Steinbeck's great novel. By compulsion, I will have to re-read this epic. It's only a matter of when.